Champions of synthetic biology believe that turning genetic code into Lego-like blocks to build never-before-seen organisms could solve the thorniest challenges in medicine, energy, and environmental protection. But as the hackers who cracked open the potential of the personal computer and the Internet proved, the most revolutionary discoveries often emerge from out-of-the-way places, forged by brilliant outsiders with few resources besides boundless energy and great ideas. 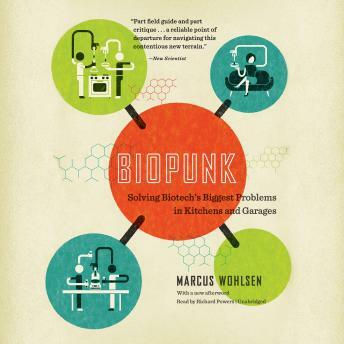 In Biopunk, Marcus Wohlsen chronicles a growing community of DIY scientists working outside the walls of corporations and universities who are committed to democratizing DNA the way the Internet did information. The "biohacking" movement, now in its early, heady days, aims to unleash an outbreak of genetically modified innovation by making the tools and techniques of biotechnology accessible to everyone. Borrowing their idealism from the worlds of open-source software, artisinal food, Internet startups, and the Peace Corps, biopunks are devoted advocates for open-sourcing the basic code of life. They believe in the power of individuals with access to DNA to solve the world's biggest problems.